All eyes on Dallas. It's set to be an exciting week. 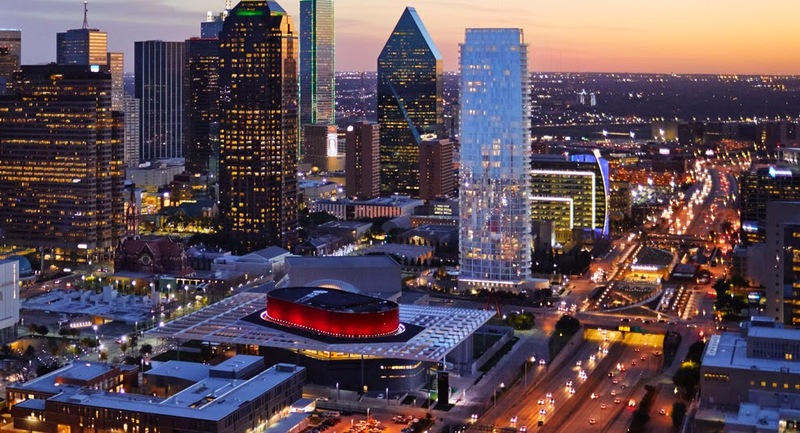 The city is on the brink of its second-annual Dallas Arts Week and Dallas' neighboring city of Arlington is gearing up to host the NCAA Men's Final Four at AT&T Stadium this weekend. The fun has already started nearby Museum Tower Dallas. At Main Street Garden, exactly one mile from Museum Tower, Conan O'Brien has set his stake in the Texas soil with the Cone Zone. The Team CoCo playground rallies the iconic comedian's presence in Dallas for live tapings of his TBS show at The Majestic Theatre through Thursday, April 3. The Cone Zone is family-friendly, featuring a Conan-ized Airstream trailer, Texas-inspired Conan fan art, video games, live music and surprise appearances from the Team CoCo personalities. You'll even notice that the famous Dallas B&G sign got restyled for the occasion. The Cone Zone is open from 2:00 p.m. - 8:00 p.m. and is free and open to the public. The NCAA Men's Final Four returns to North Texas for the first time since 1986 and it's bringing a free, three-day music festival with it. From country to indie rock to the legendary Bruce Springsteen and the E Street Band, the March Madness Music Festival just about covers every mainstream music genre. Celebrate the 20th anniversary of the Deep Ellum Arts Festival over six city blocks of Main Street in Deep Ellum with local music, food and arts. Pets welcome for a special parade on Sunday, April 6. Dallas Arts Week officially begins on Saturday, April 5 and ARTsPARK is one of the many events encouraging awareness and appreciation of Dallas-grown arts and cultural events. ARTsPARK is the perfect introductory event to Dallas Arts Week featuring various organizations, live performances, volunteer opportunities and demonstrations from 12:00 p.m. - 4:00 p.m.
A highly-anticipated exhibit opens this Sunday, April 6 at the Perot Museum, which is an easy stroll from Museum Tower. Members of the Perot Museum can get a special sneak preview before the exhibit opens to the public Thursday, April 3 - Saturday, April 5. Museum Tower will provide reminders and valuable content about these events and more on this blog and on its social media networks. Like Museum Tower on Facebook and follow @MuseumTwrDallas on Twitter and Instagram.